Would you like to become a member of SWAG? New members are always welcome. We meet on the 2nd Tuesday of each month. Our aim is Friendship, Fun and Forays. Our programme for 2018 is available from our Secretary Jane. You can contact us using the website email address web.group@msn.com. Peter Dare came to talk to us about his working life as a stone mason – a career which eventually took him from Beer Quarries to Australia where he worked on the cathedral at Brisbane. Peter began work as an apprentice banker stonemason in 1956 when techniques for removing stone blocks from the quarry had hardly changed since medieval times – using chisels, files, mallets, hammers and saws meant that progress was slow – taking an hour to manually saw an inch of stone from the fifteen acres of underground caves. Kilns at the quarry still produced lime for agricultural use . In 1959, the quarries were closed and Peter was offered work at Swansea or Portland as by now construction of stone built blocks of flats was taking over the industry. Peter became a travelling mason when his apprenticeship was completed and found himself in Petersfield building a church porch before working in Oxford on the University Library. He later worked on the Radcliffe Camera building after completing a course in brick building. In 1968 Peter returned to Devon working as a general builder which led to him working on Exeter Cathedral where in 1969 he became a master mason – quarrying his own stone from Beer and a second quarry at Salcombe Regis. Before leaving he incorporated the carved faces of his daughter, various bishops and even those of visitors into his work. By 1985 Peter had left to work for himself, later becoming a partner in a firm of masons doing conservation work on Truro Cathedral, Exeter Guildhall and the gatehouse at Shute amongst other places. In 1989, Peter worked on the completion of Brisbane Cathedral on which building had begun in 1906, buying a quarry from the government and employing modern computerised machinery to cut stone twenty four hours a day. Peter received the Australia Medal for his work in 2007 and is also the recipient of an award from the Queen. We were left in awe of his lifetime work and thought how wonderful it must be to be able to literally look at his achievements. The Axminster Recovery Centre was founded in 2007 by Catherine Davis and this month Shelagh Fearnley came to talk to us about it. This organisation works within the Axminster Medical Practice with the idea that people need professional help but not necessarily from doctors - for example with counselling and various therapies - some two thousand patients have used it with costs running at around £80,000 per annum. No capital funding is available for this service – most patients assume that it is part of the NHS - and with growing costs funding has to rise too and the organization raises money with coffee mornings, planned events and a shop .One of our members spoke of how the service had been of help to her and we all agreed that this needs to be maintained and sustained. We are very grateful to Sheila for coming along to speak about the organisation for which she works especially as it was all at the last minute. There is an ARC website where donations can be made. "Arc Axminster provides easily accessible, flexible, local counselling and psychotherapy at the heart of the community." November 2018 - Flower Arranging. Jackie Nicholls, who runs Flower Arranging Workshops at Combe St Nicholas, came to our November meeting armed with lots of useful tips and beautiful flowers to create two arrangements. We learnt that choosing rosebuds that feel firm to the touch are the freshest and laying the whole stem in water will often prevent the head from drooping. Newly purchased flowers should always be unwrapped straight away and the stems trimmed by an inch or so cut at an angle. Oasis blocks should never be pressed into water but simply left to sink and absorb moisture and if replacing a flower into the foam cut across the stem yet again. Chrysanthemums should be stripped if their foliage especially if the leaves are damaged .Warm water will help a flower to open but use cold if trying to prevent early opening. At the end of the meeting two lucky members won Jackie’s beautiful arrangements as raffle prizes whilst the rest of us resolved to apply our newly acquired knowledge to flower arranging with renewed enthusiasm. From humble beginnings as horse traders, the Hoare family became bankers and in 1717 Henry Hoare was looking to invest his fortune and secure his family’s future. His solution was to buy land in Wiltshire, demolish medieval buildings and replace them with a Palladian villa. Henry died before it was completed but his son, also named Henry, completed the house and landscape, enduring the loss of two wives and heirs as he did so. Richard was the next custodian of the estate – immersing himself in a grand tour of Europe and sending back crates of treasures for the house. Two new wings were added to do the treasures justice and today they are enjoyed by the many visitors. The Hoares took a more naturalistic approach to the development of the gardens, letting the land speak for itself rather than have the formal layout of many of our great houses. The lake is surrounded by woodland interspersed with temples and follies. Other areas are filled with flowers, shrubs and fruit trees with large expanses of grass and farmland visible on the edge of the estate. On the day of our visit the beautiful sunshine showed the whole estate at its very best, dressed in the colours of early Autumn. A splendid day out. We gathered at Whittons auction house for our meeting this month where, once again, we pitted our wits against the world of antiques, their identification and valuation. Items displayed for our attention included an oriental vase, an oil painting, an ornate clock , a beautiful silver coffee pot which turned out to be an Exeter piece and therefore very valuable, as well as a pair of Georgian tables and a very pretty inlaid box. A beautiful crescent brooch set with diamonds and able to be fastened into a tiara or necklace gave us a glimpse of a bygone age. A gentleman’s watch set on a leather strap and valued by many of us as a designer item and therefore a valuable thing was in fact a fake!. Last year Edward, our auctioneer, told us that all so-called brown furniture was being exported worldwide but that now places like Australia were taxing these imports and therefore the sales were down – meaning that, hopefully, we can still find some lovely old items going for a song at a future auction. August 2018 - Jessica Cross. Gold was the subject for this month’s meeting when Jessica Cross, who formerly worked as a mineral economist for a South African company came to talk to us. She was responsible for its future, taking in everything from the 100,000 workers to price forecasting. The board with which she worked was made up of men who had little understanding of the gold market in terms of jewellery and it’s sale. So Jessica created a set of profile ‘girlfriends’ to enable the company to explore the market in more detail. These profiles made for a very interesting evening with aspects of gold that many of us had not considered. First there is Eleanor – an empowered, independent woman who used jewellery as an adornment and an extension of her personality. She would buy at the top end of the market where there was a high mark up on the pieces and would be emotional towards her purchases. Second there is Noor – she has no vote, no independence, an arranged marriage and could be simply discarded by her husband in favour of another wife. Her jewellery would be very simple in design and she would always wear it beneath her burkha in the knowledge that if she was discarded and thrown out on to the street she could sell her jewellery in order to survive. At this level, it is cheap to buy and is known as jewellery of the subordinated. Women sometimes wore breastplates of gold as their pension fund. Third there is Jasmin - living in India where dowries are illegal but still flourishing, gold is saved from birth as a payment to a bridegroom and is seen to demonstrate social standing. Fourth there is Tracey – an anti-establishment girl who wears Nike and Burberry tartan with her gold. Her jewellery will be from the cheap end of the market. We were reminded of Gerald Ratner who commented in a speech that his product was rubbish and was forced to resign after the value of the Ratner Group plummeted. Having had a successful career in the business world, Jessica is now sheep farming and enjoying a very different kind of life. How lucky were we when we caught the coach to Bristol. It was not as hot as it had been the previous few weeks but much better for walking around the Quay and exploring Brunel’s ship the SS Great Britain. Our guide took us round the ship and explained that it was built in 1843 at the docks in Bristol where she now rests in a dry dock, that it took 60 days to get to Australia, much faster than any other ship at the time and that it carried 630 passengers plus about 140 crew. A gold rush in Australia encouraged gold diggers to spend the equivalent of today’s ticket prices.It made 47 voyages over 88 years to 32 to Australia, plus voyages to New York, San Fransisco, Crimea and Bombay. They carried on board cows, pigs, sheep, geese, turkeys and chickens, to mainly feed all the 1st class passengers en route. Plus of course barrels of water and beer.She had square sails which were used to carry her forwards in the right wind conditions but she also had a coal driven steam engine with a huge screw propeller for use when necessary. This was the first time that one had been used on an ocean-going ship.We were most impressed by the size of the bunks. People were certainly much smaller then and quite thin. However on the diet that most of the passengers had I am not surprised. Most of the meat was for the 1st class passengers who ate in the most amazing gold leaf covered dining saloon. After being damaged in a storm she was taken to the Falklands where she spent the end of her working life as a warehouse until she was towed back to Britain to be restored where she is today. I would certainly recommend a visit to see round her and to go down underneath in the dry dock. In a change to our programme this month, Spencer Kingdon gave us a very entertaining talk entitled ‘Boy on a Farm’ – the boy in question being himself, having moved to a farm when his father returned from fighting in the second world war. Previous to that, he had lived in the village of George Nympton near South Molton where the pub, as he put it, was the 'centre of re-education‘ or gossip as it was otherwise known. This is how he came by the name of Spencer – after the prime minister of the day Winston Spencer Churchill . (His wife refers to him as ‘expense’ from time to time !) The farm replete with loo at the bottom of the garden, no running water, electricity, gas or oil provided opportunities for adventures – watching the men emerging from the barn, where the cider press was kept, in a great state of inebriation, bunking off school which was a three mile walk away, hiding in the enormous farmhouse and checking beneath gooseberry bushes daily for any new arrivals! Self medication was the order of the day with de-horning fluid used to deal with corns on the feet. Sadly this life came to an end when his mother died and his father, suffering still from the effects of the war and drinking heavily, left the family. Spencer went to live with his Uncle and Aunt in a bungalow near Lynton. They decided to adopt him which entailed inspection of the home by the council necessitating a hasty scrub for Spencer with carbolic soap and a quick run with the Ewbank cleaner over the floors until it spilled the contents. A court appearance and a payment of eighteen shillings and sixpence meant that adoption was complete. Spencer later married and went to live near Nottingham bringing up three sons – all of whom, according to the old tradition on holding a needle on a thread and watching in which direction it spun, should have been girls. This was a lovely insight into life as it was many years ago in Devon – a life which some of us could just about remember! We are indebted to Mel Pym for standing in at our annual quiz night. This was a fun event with Mel well and truly in charge as the competition heated up with questions ranging from gardening to general knowledge .In the course of the evening we learnt that Sir Charles Isham is responsible for bringing garden gnomes to this country ; that Cheddar, Skywalker and Graffiti are varieties of Cauliflower - whilst Sonata and El Santa are Strawberries. Some of us could recall that the Duke of Wellington’s horse was named Copenhagen ; that there are nine hoops in a game of Croquet; that the wedding ring in the Owl and the Pussycat cost one shilling and that sliced bread was actually introduced in 1930. Victory went to the Daffy Dils who were presented with plants , Flower Power a close second and Fairweather Gardeners third. At the onset of World War II, Nina Duchess of Hamilton and Brandon, pondered the fate of family pets about to be abandoned as their owners went off to war. She was so concerned that she did a radio broadcast and soon found herself confronted with some forty pets left on her doorstep, Ferne House in Berwick St John near Shaftesbury. Needless to say, many of their owners did not return from the fighting and so Ferne Animal Sanctuary was born, the Duchess leaving the estate as a home for the animals in perpetuity upon her death in 1951. The organisation was then run by a friend until 1963 whilst all the finances were established and Ferne as we know it today was developed from the Duchess’s country house. In 1975, the estate was a collection of ramshackle sheds and was rehousing pets from a radius of some forty miles. A cattery was built first and fund raising took off with the sanctuary raising half a million pounds in eleven months to fund kennels and other necessary buildings. Today Ferne is home not only to dogs and cats but to abandoned cows and calves found wandering the paths in the sanctuary, goats who had been living in a second floor flat in Bristol, horses and ponies whose owners could not afford to keep them ,a variety of small furry creatures, together with geese and ducks. The local community plays a part in running the Sanctuary with gifts of food together with plenty of volunteers who help with day to day things like dog walking. The site has been developed with nature trails, a cafe, children’s play area, a sensory garden and tree planting, together with conference facilities and offices. These have been made possible by benefactors like Betty Blakeborough who left £100,000 in her will and George Miller who used a collecting box to receive donations and who is commemorated by a wishing well for further donations to this day. The aim of the sanctuary of finding forever homes for furred and feathered friends for over seventy-five years continues. Our annual Bingo was held at the Tuckers Arms at Dalwood. Steven Hussey from the Devon Wildlife Trust was our guest speaker this month on the subject of Beavers. There had been none in England for 4-500 years so when one appeared on the Otter river in 2010 a great deal of interest was aroused. By 2013, camera traps proved the existence of such creatures but a public outcry ensued when the government decided that a licence was needed to re-introduce Beavers to the countryside – they do carry not only parasites which can be harmful to humans but also bovine TB. An official trial is now in progress until 2020 when a decision is expected on their future. Meanwhile, there are now three males and two females – with their only predators being dogs, they continue to do well. Adults can grow to 20 kilos and they are expert diggers and swimmers enabling them to build dams and lodges from where they feed from the riverside foliage. Two or three kits are born each year which are able to swim immediately. 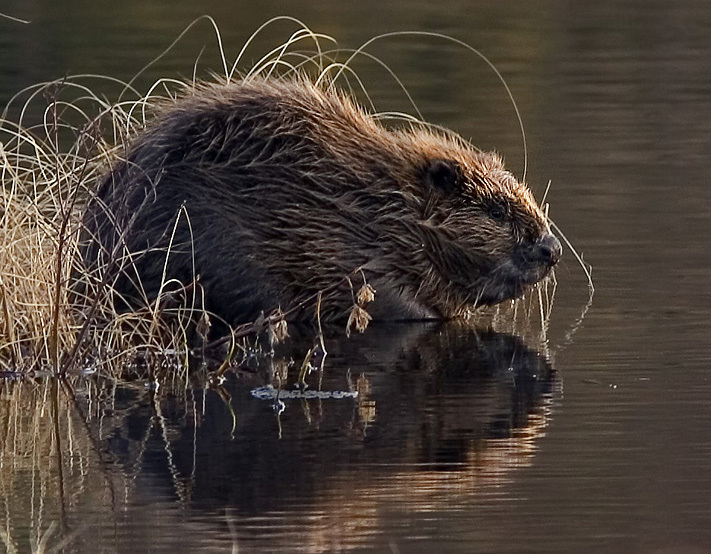 Beavers have poor vision but excellent hearing and sense of smell and are able to stay underwater for 15 mins at a time. Their dams and water structures have been shown to have great benefits to other water life such as frogspawn and fish. There are helpful effects on flooding and water quality. Regular testing and monitoring is taking place so as to provide the fullest picture for the government report. Whitton’s auction house in Honiton was the scene for our October meeting in the form of a quiz where we were confronted with various antique items for identification and evaluation. This formed the basis of a very entertaining and informative evening. Many of us coveted the diamond, onyx and seed pearl brooch made in Bond Street and valued at £6000, whilst others preferred the beautiful Exeter silver tankard – unusually assayed in Plymouth – dated 1716 and worth some £4000. A French Kingswood veneered cabinet inlaid with ceramic panels and made in the 18th century was valued at a mere £1500 . Perhaps a Famille Rose Charger from around 1800 at £3-400 would be of interest ? Sadly Edward, our host for the evening, told us that so called ‘ brown furniture’ held little value and that much of the sale contents these days was exported as far as Australia. The fact that houses are becoming smaller meant that larger furniture items like wardrobes do not sell, as cheaply made modern replacements flood the market. The evening certainly generated much interest and the auction rooms will certainly be frequented by more of us in the future. This month’s meeting took the form of an outing to Buckfast Abbey where, thankfully, the rain held off and we had sufficient sunshine to enjoy the day. The grounds, although past their best at this time of year, were laid out as Sensory, Physic and Lavender gardens as well as widespread lawn areas with trees. The Abbey itself, having been built by the monks, is beautifully maintained – full of light with enormously high white pillars supporting a beautiful brick patterned roof with central decorated ceiling panel. A vast modern metal and beautifully coloured stain glass window depicting Christ sits behind the altar occupying the whole end wall of the abbey. Beautiful music and prayers at an unexpectedly encountered short midday service furthered the whole experience. May 2017 - Val Bugden-Cawsey. Do you remember a time when the only fast food was fish and chips? When signalling whilst driving was with hands out of the window? What about black and white television? Hotpoint twin tub washing machines? We were reminded of these and many more memories by our speaker this month – Val Bugden-Cawsey who came to remind us that we needed to grow old disgracefully! Julie Andrews, when in the Albert Hall for a particular birthday celebration, chose to re-write her famous 'My Favourite Things' song in which she included back pain and fractures rather than snowdrops and kittens (Val gave us an excellent rendition of this). A copy of 'The Mature Times' from her local library yielded a page three which featured a vicar who sang his whole service – not everyone’s idea of what page three might contain. Other clear signs of aging included getting puffed out when playing cards, needing your glasses to find your glasses, and adopting the motto 'what doesn’t hurt doesn’t work'. This was a really fun evening from start to finish and convinced us that the only way to deal with aging is to be at least somewhat disgraceful. This month saw the return of Mike Short for our annual quiz night – the difference being that this year we had questions on not only gardening but general knowledge as well. Champagne did not originate in France but here in England – which was a surprise to many of us. One of the first Xmas cards was sent from Devon when the custom began in 1843. Throughout history babies were christened not with holy water but with Cider. Spinach is known as the King of healthy vegetables whilst Strawberries first came from Turkey. Young trees are known not only as saplings but as whips. The largest herbaceous flower bed in the world is at Kew Gardens whilst the largest flower market is in Holland. The fun evening ended with victory for the Snowy Owls team who were suitably rewarded for their victory with Fuschia plants . John Evans, our speaker this month, has very limited sight with only tunnel vision in each eye. This condition is hereditary and untreatable although stem cell research might enable the retina of the eye to regrow at some point in the future. John describes his remaining vision as scanning through a Biro tube with the prospect of eventually losing his sight completely. He decided to investigate the process of acquiring a guide dog which meant both man and dog being assessed and matched for speed, size and strength. John stayed at a hotel for two weeks with a suitable dog – in this case Johnnie – one of a litter of ten black Labradors. He discovered that this entailed getting used to the dogs routine with half of each day spent training and the rest for general welfare. John confessed to wanting to give up at this point and had to be talked out of it – but after six weeks, John and his new friend were able to transfer back home. They set about learning new routes together, dealing with traffic and would have regular exchanges with their trainers until Qualification Day. After this guide dogs ‘work’ for around two hours a day and then have rest and recreation much like any other dog. Johnnie certainly claimed lots of our attention at the meeting – we hope he enjoyed meeting us as much as we enjoyed meeting him. Advance notice of SWAG meetings and events are included on the Calendar page. Please click the button. Find out more about ARC at their website. Designed by Isambard Kingdom Brunel. The first screw-propelled, ocean-going, iron-hulled steam ship. Launched in 1843.